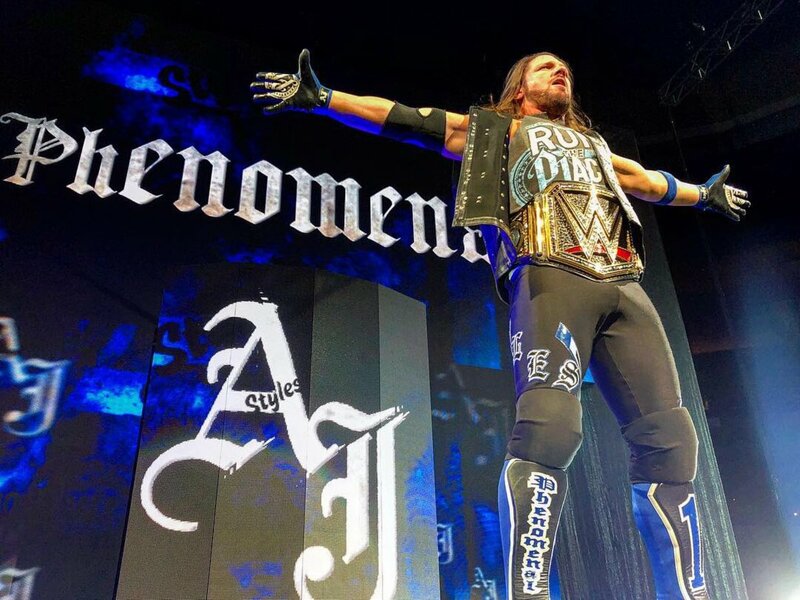 WWE held a dual-brand house show at the TD Garden in Boston, Massachusetts last night. Disappointing attendance. No Roman Reigns, Alexa Bliss, or Rey Mysterio. Decent enough action that saw Hardy win with the Swanton. After the match, Randy Orton ran out and attacked Hardy, who was held by Almas. Orton beat on Hardy until hitting the RKO. Balor won by disqualification after Lio Rush pushed him off the top rope. Again, there was solid action in this match. Rush spoke the whole time on the mic while Lashley was in control. Balor fought off Lashley after the DQ and chased Rush around ringside after a failed sneak attack. Balor threw Rush back inside, hit a shotgun dropkick, and followed that with the Coup de Grace. Elias' pre-match bit was really brief, with him basically only saying that Boston wasn't worthy enough to hear his music. Besides a nice opening sequence between Gable and Scott Dawson, this was forgettable. Corbin won when the match broke down and he hit Jose with the End of Days. Rusev interrupted English's singing. English yelled at Lana that she was the reason he was fighting Rusev. She slapped English, then Rusev won with the Accolade soon after that. The match only went a few minutes. Charlotte got cheered coming out. Lynch got some cheers too, but not much more than Charlotte. After a few minutes, The IIconics came out to attack Charlotte. Carmella and Asuka made the save, which led to a six-woman tag match. The crowd liked Carmella, who compared The IIconics to the Chicago Bears after they lost to the New England Patriots earlier in the day. Carmella called herself a Patriots fan. Charlotte submitted Peyton Royce with the Figure Eight. Carmella and The IIconics did most of the work. The match was a little messy but kept the crowd's interest. This was the best match of the night and went about 16 minutes. They had some good near falls that the crowd bought. The finish came when Ziggler hit Rollins with a low blow and the referee called for the bell. After the match, Ziggler and McIntyre took chairs and hit them against the stairs and post -- but Braun Strowman came out and punched the chair out of McIntyre's hand before hitting Ziggler with a powerslam. Strowman left and Rollins and Ambrose got some revenge before leaving. Banks received a great hometown reaction. Most of the match was the heels getting the heat on Bayley. There was a triple suplex spot that got over great, and Banks submitted Riott with the Banks Statement to get the win. Fun match. A lot of this match was shtick. New Day threw pancakes at Cesaro and Sheamus before the match and Kingston twerked at the start of it. Sheamus pinned Kingston with a roll-up while holding his tights. Not much to this. Great reaction for Rousey. James did a great job in her comedy spots with Jax and in the ring with Rousey. For the finish, Rousey escaped a roll-up and turned that into an armbar. Bryan's entrance got the loudest reaction from the crowd. The match went about 16 minutes, with the finish coming when Styles hit Nakamura with the Styles Clash after a Tower of Doom spot. There was a loud dueling chant for Styles and Bryan in my section. They did a lot together, and Nakamura would run in and attack from behind.